Gourmet, Gourmand, Glutton: The critic within us all. An Eater in a Foodie World. The critic within us all. I love to eat out at restaurants. The food is, of course, the main motivation for my visit, but I do enjoy the full experience of dining out. However, if the food is REALLY good, I have no qualms about overlooking the more negative aspects of my meal. I have dined within houses of ill repute with nothing but fond memories. Sketchy kitchens, war zone-like neighborhoods, bad service, and restaurants with the personality and charm of a maximum security prison will not deter me from a great meal. Food is king in my dining experiences. Everything else is just filler. During the time I have spent so far putting this blog together, I have thought about what direction I wanted to take it and I, ultimately, asked myself this question: do I want to write as a food writer, or do I want to write as a food critic? I have my favorite food critics. The one I turn to for restaurant reviews, first and foremost, is Raphael Kadushin. He is a regular contributor to Bon Appétit, National Geographic Traveler, Condé Nast Traveler, Epicurious.com and Concierge.com. He also writes restaurant reviews for a local alternative newspaper here in Madison called the Isthmus. (He's based out of New York, but he's also an editor at the University of Wisconsin Press.) His word is law when it comes to my choosing of restaurants to frequent. His tastes and his opinions have been spot on with my own since the very first article of his I read back in 2006. He's honest, first and foremost; sometimes to the point of brutality. There are restaurants here in Madison, (as, I'm sure, in other places,) that hate his guts. But, he will honestly try to find some good in a bad restaurant, as well as criticize individual dishes in restaurants he likes. These are the qualities I look for in a restaurant critic. There are other critics that write for the Isthmus that I don't like so much. Either they are nothing more than free advertising, not seeming too willing to criticize anything, or they exude a snobby, "too-good-to-eat-here" attitude that rubs me the wrong way. I'll stick with Raphael, thank you. A new favorite of mine here in the blogosphere is Eating Madison A to Z. Some years ago, I was involved with a few friends of mine in a group we called Saturday Lunch Group. Almost every Saturday afternoon for more than two years, we would get together to eat lunch at a different restaurant. 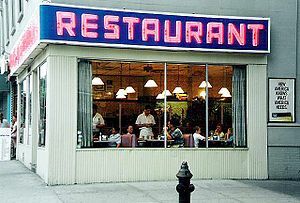 We had a simple rule that at least two people in the group, (there were three of us most of the time,) had to have not ever eaten at that restaurant. We complied a list of nearly one hundred restaurants. I was impressed with this number for a long time...until I ran into the Eating Madison A to Z folks here on the internet. As I'm writing this, they just posted their 734th restaurant review!!!! I feel like a slouch by comparison! They use the "Eats" list of the Isthmus as their guide to choosing restaurants to review, put them in alphabetical order, and off they go. 734...that boggles my mind! So, then the question becomes, "Do I want to write restaurant reviews?" The short answer is: yes. But, I won't do them very often. As I have said before, I'm a student and I live on a students' salary. (Thank goodness I like ramen noodles!) I think, for our purposes here, I'll do one restaurant review per month and incorporate the format into the blog, along with the rest of it. As an amateur food writer and as an anthropology student, I think a holistic approach works best; a little bit of everything will work well with what I envision this blog to be. Food writer or food critic? The answer is...yes. Next time, we'll talk about chili. I even have a recipe for ya! Until then...cheers! Ooh ooh, which one am I? Kidding aside, I think our food writers are pretty solid at Isthmus. Everyone has an off day now and then. Are you still reading us, or have you written off everyone but Raphael? I haven't given up on you guys entirely, I do read every review. But sometimes I wonder if I'm reading some of the reviews the same way I read Dave Blaska's blog...for amusement, rather than information. Jay is a man with a computer, telling you what he thinks, what he sees, and occasionally, what he feels. Jay likes food, art, politics, video games, and talking about himself in the third person. Copyright 2011-2013 by Jerry D. Adkins Jr. Awesome Inc. theme. Powered by Blogger.